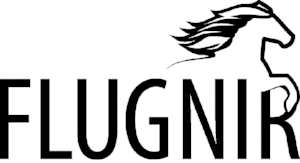 Flugnir Icelandic Horse Association was founded in 1999 and was the first official Regional Club to be recognized and sanctioned by our national breed organization, the United States Icelandic Horse Congress. Founding members were Sally Niemann and Barb Riva of Wisconsin, and Sharon Johnson, Debbie Cook, Judy Strehler, and Sigrid Younger of Minnesota. "It was our hope to form an organization that would be an ideal way to connect with other Icelandic Horse owners, support each other, and enjoy this wonderful breed of horse to its fullest capacity, while still keeping our mission statement in mind: To preserve the uniqueness and integrity of the Icelandic Horse." Over the past several years the organization has taken on additional responsibility toward the growth, knowledge, and promotion of the Icelandic Horse in the Midwest through breed demonstrations and drill team performances at the two largest Horse Fairs in our area: the Minnesota Horse Expo in St Paul, MN and the Midwest Horse Fair in Madison, Wisconsin. We have also successfully offered the first regional club-planned Icelandic Breeding Horse Evaluation in the U.S. and hope to offer many more in the future. We continue to offer fun events such as camping, day rides, fun shows, and parades. We also strive to offer instructional events to our members such as clinics and competitions to both adult and youth riders. If you are not yet a member of Flugnir Icelandic Horse Association, we would like to invite you to join us. We are small group of Icelandic Horse enthusiasts and welcome your input, knowledge, and friendship.